Model USBw 100 supports 2.3, 2.5 or 3.5 GHz bands for laptop mobile broadband services. Motorola, Inc. announced Tuesday its first WiMAX USB adaptor, the model USBw 100. At the size of a thumb-drive, the diminutive device packs a lot of broadband performance into a small space. Three versions of the stick will be available, depending on the supported frequency band -- 2.3, 2.5 or 3.5 GHz. The Motorola USBw 100 plugs directly into laptop computers to provide mobile and nomadic wireless broadband connectivity, both indoors and out. It is expected to be available in Q4 2008. Motorola's wi4 WiMAX USB adaptor has been designed with multiple antenna technology for improved signal coverage in tough to reach places. The company offers an additional performance boost if the USB dongle is connecting with either the dual antenna Diversity Access Point (DAP) or Wireless Access Point (WAP) 400 Series. In that configuration, both the uplink and downlink performance for the customer are significantly enhanced. "Our new USBw 100 adaptor will let people enjoy desktop-like performance while on the go with their laptop computers by giving them wireless connectivity to a WiMAX service provider's broadband wireless network," said Charles Riggle, senior director of strategy and business development, WiMAX devices, Home & Networks Mobility. The USBw 100 is expected to be the mainstay laptop peripheral for Clearwire USA's WiMAX launch later this year in Portland, Oregon and could also make the rounds at Sprint Nextel's XOHM network and other networks where Motorola is providing infrastructure. The development of additional sales channels for retail and e-commerce are necessary for would-be WiMAX users to gain quick and easy access to WiMAX devices such as this USB adaptor. Pro-cell Co., Ltd. was established in 1995 to based on develop & make wireless component. In the beginning, we point on GSM antenna. After to follow the market demand, and up-grade skill, we have cover antenna frequency range up to 6GHz now, be used system in Commercial for RFID, Cellular (GSM, UMTS, GPRS. ), Wlan, Wi-fi, Wi-max, PMR & Tetra; In Satellite like as weather data, Video uplink, GPS; In Security for Data, Vidio links, telemetry real time transmission, base station; In Military like as ground based radio, Wlan, data link. Most of our wireless antenna application in WLan Network, Telecommunication, wireless security, Military, Industry wireless data transfer, Medicine equipment, science experiment, traffic control & Audio/Video. Then you can find antenna in air port, port, factory, office, building, car, board, base station, hotspot and family home. Besides wireless application is increasing everyday, and we also keep follow market step to make more & more item antenna. Our production line has indoor / outdoor external antenna. The indoor antennas include Dome antenna, rubber antenna, stubby antenna, embedded PCB antenna, PIFA & some directional antenna. For outdoor hi-gain antenna, we have Panel antenna, OMNI antenna, Sector antenna, Yagi antenna, Grid antenna for your demand from 144MHz to 6GHz. We have many standard antennas that we already developed, we also welcome OEM/ODM, we will be qualified under our experience RD department, exactly production line, QC & standard measure equipment like Chamber room, software & multiple standard antenna. We are not only run business, even more in service & quality. We know the most important business in long term best service & always honest with our customer. It's in Australia. Sydney, price AU$349 ($255), plus AU$55 per month for a data plan, you can now get a WiMax card for your laptop, along with access to a pre-WiMax network that offers speeds you're not going to get from most other wireless networks (other than EV-DO, which costs much more in Australia). APC Magazine took a look at the card, and tested it on Unwired's network, and came away impressed with the speed of 750Kbit/s, which allowed them to reliably use Skype, download large files and get a clear, reliable, relatively latency free signal throughout the coverage area. The IEEE802.16e-2005 Mobile WiMAX specifications define the various functions in the Access Service Network (ASN). The ASN is that portion of the service provider network that includes the WiMAX radio base stations, antenna systems, traffic aggregation, radio resource management, subscriber authentication, IP traffic management, and IP gateway functions. Cisco Mobile WiMAX is the latest in wireless technology, fully centered on the power of IP and wireless standards. Its speed, coverage, and IP integration combine to make Cisco Mobile WiMAX an attractive choice for new mobile services or for the addition of new converged services to fixed network architectures. This open-standards solution is compliant with the Mobile WiMAX specification and the Profile C Network Reference Model. It includes a full suite of base stations, antenna systems, ASN gateways, management systems, and customer premises equipment. In the Cisco Broadband Wireless Solution, the Cisco Broadband Wireless Gateway (BWG) and Cisco BWX Broadband Wireless Access System provide IEEE 802.16e-2005 Mobile WiMAX compliant ASN gateway functionality. The Cisco BWG is software capability delivered on the advanced Cisco Service Application Module for IP (SAMI) - a high-performance service module for the carrier-class Cisco 7600 Series Router (Figure 5). The modularity of the Cisco 7600 Series and the 5-Gbps forwarding performance of the SAMI enable service providers to scale ASN gateway performance from 5 to 45 Gbps in a single chassis. The Cisco BWX 8300 Series (Figure 6) includes Mobile WiMAX base stations and antenna systems that are the first to integrate advanced beamforming technologies with standards-based Multiple-Input Multiple-Output antenna multiplexing techniques to delivering class-leading RF link budgets without the need for expensive high-powered amplifiers. The Cisco BWX 8305 provides support for the industry's only eight-element Mobile WiMAX antenna system, and the BWX 2305 supports two-element arrays to provide in-fill coverage when required. The Cisco BWX Series allows for multi-megabit service delivery, increased coverage, and greater indoor penetration, so that subscribers experience high-quality wireless services and service providers receive fewer service calls, quicken the time-to-market of new services, and improve cost efficiencies. While the Cisco BWG and BWX products provide an excellent solution for service providers who have access to licensed radio spectrum capable of supporting Mobile WiMAX deployments, Cisco also provides industry-leading solutions for unlicensed wireless access over IEEE 802.11 Wi-Fi technologies. The Cisco Aironet® 1520 and 1250 Series indoor and outdoor Wi-Fi access points enable service providers to deliver broadband wireless access for implementations of any size while benefiting from the ubiquity of Wi-Fi-enabled devices for service delivery. The Cisco ServiceMesh solution for outdoor wireless and the Unified PWLAN solution for indoor hot-spots offer service providers many key features for ease of implementation and reduced OpEx including zero-touch configuration, intelligent wireless routing that dynamically manages the creation and maintenance of the wireless network, and innovations such as Adaptive Wireless Path Protocol that optimizes, balances, and protects all traffic traversing the mesh. The Cisco Wireless Control System provides centralized design, control, and performance monitoring for both Wi-Fi mesh and Wi-Fi hotspot networks, integrating easily with existing network management and provisioning systems. The ease with which Cisco's Wi-Fi solutions can be deployed and operated, combined with the substantial number of potential Wi-Fi-enabled applications that can be offered, enables service providers to efficiently pursue innovative new revenue opportunities. Cisco Carrier Ethernet technologies are foundational to every IP NGN deployment, enabling service providers to deliver converged consumer and business services over a common IP infrastructure that is reliable, secure, efficient, and easily managed. Carrier Ethernet technologies play a significant role in the Cisco Broadband Wireless architecture, serving as the converged transport layer in both the access service network and the connectivity service network. The Cisco Carrier Ethernet IP NGN portfolio is extremely versatile, scaling from access devices such as the Cisco ME 3400 Series Ethernet Access Switches, to flexible edge/core devices such as the Cisco 7600 and XR 12000 Series Routers, to the multi-terabit Cisco CRS-1 Carrier Routing Systems. The majority of these platforms can use interchangeable shared port adapters (SPAs) for maximum deployment flexibility and greatly simplified sparing requirements. A unique advantage of Cisco Carrier Ethernet technology fundamental to the Cisco Broadband Wireless solution is transport flexibility, which enables split service architectures for business and residential services. Business services can use a centralized control plane for service management, but a distributed data plane for Layer 2 traffic. Residential services centralize both the control and data planes to enable precise control of subscriber traffic and the application of services. These features enable service providers to deliver profitable, differentiated services including consumer "any-play" alongside Layer 2/Layer 3 VPNs for business - over any access technology, including Mobile WiMAX and Wi-Fi. The Cisco Service Exchange Framework (SEF) adds significant value to the Cisco Broadband Wireless Solution and provides a clear differentiation against competitive solutions that lack an ability to enhance the way service providers interact with their customers, deploy services, build their brand, and generate revenue. SEF (Figure 9) provides the means through which service providers can enable and control the delivery of revenue-generating services by linking subscribers, devices, networks, applications, and services. It helps service providers to ensure subscriber satisfaction, maximize return on the investment in service-delivery capital, and minimize - or in some cases eliminate - operational expenses. FOUNTAIN VALLEY, Calif., October 18, 2006 — D-Link, the end-to-end networking solutions provider for consumers and business, today announced entry into the WiMAX consumer premise equipment (CPE) market with an 802.16-2005 (formerly 802.16e) compliant WiMAX router designed for service providers looking to offer wireless residential service at rates competitive with wire-line technologies. The D-Link WiMAX router combines both WiMAX and Wi-Fi technologies to offer an all-in-one solution for in-house wireless coverage with easy installation and remote management features for service providers. The router is an ideal, cost-effective alternative for delivering a fast and secure broadband connection to consumers who are not reachable by DSL or Cable broadband services. "As a trusted supplier of business-class networking infrastructure products for broadband service providers around the world, D-Link is once again delivering another value based, quality product that is from our core strength in wireless connectivity," said Steven Joe, CEO of D-Link North America "We know the 'last mile' in reaching potential broadband customers can be the most expensive to complete. With this new WiMAX router we enable service providers to bridge the distance with secure, wire-line performance at a fraction of the cost." This router supports wireless metropolitan area network (WMAN) and multiple physical layer (PHY) protocols. It supports adaptive modulation - 64QAM, 16QAM, QPSK - with up to 5 b/s/Hz spectral efficiency, and 1K fast Fourier transform (FFT) and channel bandwidth up to 20 MHz. Security implementation is based on AES-CCM (advanced encryption standard). Efficient MAC secure data unit (SDU) fragmentation/packing maximizes bandwidth utilization. The D-Link 802.16-2005 WiMAX Router will be available for service provider testing in Q4, 2006. Products will be commercially available in the first quarter of 2007. D-Link is the global leader in connectivity for small, medium and large enterprise business networking. The company continues to strive for excellence as an award winning designer, developer, and manufacturer of networking, broadband, digital electronics, voice and data communications solutions for the digital home, Small Office/Home Office (SOHO), Small to Medium Business (SMB), and Workgroup to Enterprise environments. With millions of networking and connectivity products manufactured and shipped, D-Link is a dominant market participant and price/performance leader in the networking and communications market. D-Link Systems, Inc. headquarters are located at 17595 Mt. Herrmann Street, Fountain Valley, CA, 92708. Phone (800) 326-1688 or (714) 885-6000; FAX (866) 743-4905; Internet www.dlink.com. Win-Max™ is WiNetworks advanced Broadband Wireless Access (BWA) solution offering advanced service suite and network control supporting thousands of users. Win-Max™ is a leading WiMAX compliant Broadband Wireless Multimedia platform for broadband operators seeking to provide fast and cost-effective delivery of IP-based triple-play services to residential and SoHo customers over large geographical areas. Win-Max™ comprises of WiN4000 WiMAX 16d compliant base station, WiN7000 16e compact base station, WiN2000 16d and WiN5000 16e WIMAX compliant CPEs, and WIN1000 multi-service gateways. The Win-Max™ product family is available in 3.5Ghz and 1.4-1.6GHz. Other spectrum versions are in development and will be announced soon. The WiNMS (WiNetworks NMS platform) provides a comprehensive end-to-end control over the WiNetworks systems and service delivery. Win-Max™ systems are specially designed for robustness and simplicity. Win-Max™ systems are extremely simple to deploy, operate and maintain thus offering outstanding operator economics, combining feature-rich service delivery with low deployment and operation costs, for unmatched operator short ROI. Now supports WiMAX Multi-stream MIMO Testing! LitePoint IQmax® 802.16 WiMAX Test Solution is expressly designed to test all 802.16e-2005 / WirelessMAN-OFDMA and 802.16-2004 / WirelessMAN-OFDM PHY waveforms for broadband CPE products. Based on an integrated vector signal analysis (VSA) and vector signal generator (VGA) architecture, the single-box test system tests critical physical layer radio parameters for developer, product verifier, volume manufacturing and quality assurance stations. The system interfaces with the device under test (DUT) RF ports through its integrated VSA and VSG subsystems. Baseband I/O signal interface and analysis is also supported. The dual RF ports are selectable for either Tx or Rx operation and support the 1.7 to 2.7 GHz, 3.3 to 3.8GHz, and 4.9 to 6.0 GHz frequency bands. Two to four IQmax-500 R&D Test Systems can be synchronized and combined for multi-stream Multiple In / Multiple Out (MIMO) testing. The resulting scalable MIMO test system features multiple, synchronized VSAs and VSGs designed to characterize and test the latest MIMO WiMAX (“wave 2”) and WiFi (“11n”) products. The system accurately generates RF and Baseband MIMO signal waveforms, and analyzes real MIMO signals from multiple RF (antenna) ports or Baseband interfaces. In addition to SISO signals, the powerful IQsignal for WiMAX GUI Software is also able to generate and analyze MIMO signals and to control the multiple instruments in an IQmax MIMO Test System. With the WiFi IQmax system option, the IQsignal for WiFi/MIMO software application is also fully supported. The LitePoint IQmax Link-based Test Unit is designed to enable link-based testing of WiMAX DUTs when connected to an IQmax Test System. WiMAX subscriber stations are typically designed to operate with a connection to a base station, although chip suppliers may provide a special test driver to allow testing without a link being established. In the cases where the DUT requires a “live” link to be present to test and calibrate the receiver and/or transmitter section, the IQmax Link-based Test Unit along with the IQmax Test System must be used. MIMO System Configurations: Starter System is configured for 2x2. Simply add IQmax-500s for 2x3, 3x3 and 4x4 configurations. To use Clearwire's current service (ranging from $30 to $50 a month), you just set up a nine-inch-high modem and plug it into the Ethernet jack on your PC. This one box is all you need for full Net access -- say goodbye to DSL or cable-modem charges and wires -- and it will work anywhere in the city. KIRKLAND, Wash. — Clearwire Corporation (NASDAQ: CLWR), the world’s largest WiMAX-class service provider, today marked a major milestone with the Federal Communications Commission’s (FCC) final approval of the first WiMAX-class laptop card that will connect to the Clearwire network. Following the FCC approval, the new wireless broadband product is on target to be available in Clearwire markets during the second half of this year. “Motorola’s Expedience® wireless access system delivers high speed, nomadic broadband access for Clearwire’s customers, and our new laptop card will give them even more convenience as they connect to the information, entertainment and people that are important to them,” said Fred Wright, senior vice president, Motorola Networks & Enterprise. The new Clearwire laptop card is part of Motorola’s wi4 Expedience solutions. The high performance, wireless access modem is a true non-line-of-sight device, requiring only a simple driver to be added to the customer’s computer. The product fits into a standard Type II laptop card slot on portable computing devices and is compatible with Microsoft Windows Vista and XP operating systems. Clearwire, founded in October 2003 by Craig O. McCaw, is a provider of reliable, wireless high-speed Internet service. Headquartered in Kirkland, Wash., the company launched its first market in August 2004 and now offers service in 37 metro markets, covering approximately 8.9 million people in more than 350 municipalities in Alaska, California, Florida, Hawaii, Idaho, Minnesota, Nevada, North Carolina, Oregon, Texas, Washington and Wisconsin in the United States, as well as 1.2 million people in Ireland, Belgium and Denmark (under the Clearwire name through Danske Telecom). Airspan offers a complete solution for the Municipal Wireless and Public Safety markets. In a single cost effective package, Airspan uniquely combines the performance and capacity of WiMAX with the flexibility of Wi-Fi. Available in both 4.9GHz versions for Public Safety applications and 5.8GHz for Municipal Wireless applications, both access and back-haul are combined into a single integrated solution. The system uses standards-based 802.11 Wi-Fi for access so that any Wi-Fi enabled device can access the network, if authorized. The backhaul network is provided by 802.16 WiMAX, either 4.9GHz or 5.8GHz depending on the customer requirements. Complete network management and provisioning of all WiMAX devices is done via the Netspan Network Management system. The system provides all the benefits of a Wi-Fi Mesh solution, with the added benefit of higher capacity and quality of service at no extra cost. The WiMAX architecture is designed to scale without degradation in performance. Traditional Wi-Fi Mesh systems cannot support a large number of hops without severe performance loss. The Airspan Municipal Wireless solution provides consistent performance while enabling the operator to offer a range of services at different levels to customers. MicroMAX Base Stations providing high performance backhaul. All outdoor solution components are ruggedized and weather-proof, designed to be easily installed on utility poles, lamp posts or rooftops. The base station provides a point to multi-point connection to the access points and CPE’s. The ProST Wi-Fi AP provides the access to all Wi-Fi equipped devices. The Netspan network management uses an intuitive web interface enabling the equipment to be commissioned from any remote location. With the housing and mechanics based on the field proven AS.WipLL product, the Airspan Municipal Wireless solution is proven with thousands of nodes installed to date. Specifically in Tokyo, Airspan is currently building one of the largest municipal wireless networks of up to 30,000 nodes. The ProST Wi-Fi dual radio Access Point is easy to install, with an integrated WiMAX antenna, external Wi-Fi antenna and all mounting accessories. It supports backhaul redundancy - if there is a failure the ProST Wi-Fi will automatically search for another base station. All standard Wi-Fi security mechanisms are supported including as WPA2 and up to 16 VLANs. TESSCO Technologies Incorporated is a value-added supplier of the product solutions needed to design, build, run, maintain and use wireless systems. As Your Total Source(R) supplier of mobile and fixed-wireless network infrastructure products, mobile devices and accessories, and installation, test and maintenance equipment and supplies, TESSCO assures customers of on- time availability, while streamlining their supply chain process and lowering inventories and total costs. BridgeWave’s new AR80 & GE80 E-Band (80GHz) point-to-point wireless bridges provide reliable wireless connectivity up to 5 miles. The AR80 & GE80 high-capacity links are perfectly suited for applications such as inter-building LAN extensions, server centralization, remote data storage & backup, redundant fiber overlays, disaster recovery and backhaul. Firetide provides an instant Mesh Networking solution that is ideal for building backbone infrastructure in Wi-Fi applications. Firetide’s HotPort high performance mesh network provides high capacity, self-healing wireless mesh backbone for outdoor and indoor networks. The HotPort family includes a multi-port 10/100 Ethernet switch for each node, VLAN capability, traffic prioritization, remote management, creating secure reliable wireless networks for video, voice and data. Firetide HotPort 3000 Mixed Wireless Mesh Router Starter Kit includes 2 outdoor mesh routers, one indoor router, power adapters, Instant networking guide, warranty card and end user license agreement. Siemens spa Italy selected Altera's Stratix II FPGAs and Nios II embedded processors to develop their WayMAX basestation. WayMAX leverages the flexibility, performance, and time-to-market of Altera's programmable logic to address the emerging broadband wireless access market, while providing a path to support future WiMAX standards without costly upgrades. The dynamic nature of today's wireless broadband market demands that Siemens use solutions which meet the most rigorous technical requirements while delivering the flexibility to adapt to changing standards and market conditions. Altera's Stratix II FPGAs and Nios II processors provide Siemens with the best performance, the ability to integrate off-the-shelf processors and other discrete devices, and the shortest development time, making them the ideal choice for their WayMAX base stations. Additionally, having access to Altera's HardCopy® II structured ASICs provide Siemens with an attractive, low-risk path to reducing the cost of their solution. WayMAX is Siemens' end-to-end WiMAX solution. It employs non-line of sight orthogonal frequency division multiplexing (OFDM) technology that complies with the IEEE 802.16 specifications developed by the WiMAX Forum for wireless high-speed internet access. OFDM technology, which protects wireless broadband transmissions against interference from echoes and multipathing, requires high-performance digital signal processing (DSP) functions. Siemens selected Altera® Stratix II devices as the best programmable logic choice to deliver these functions. In addition, the reconfigurability of Altera devices enables Siemens to offer their customers remote network upgrades without hardware replacement. This advantage allows the WayMAX solution to support the latest standards as they are approved, further demonstrating Siemens' ability to offer some of the world's first standards-compliant WiMAX radio networks to fixed and mobile network operators. The Ovation MCU2000 is a Fixed Mobile Convergence - Wireless Home & Mobile Office 3G solution that unifies WWAN, WLAN/LAN to provide cost-effective high speed wireless broadband access, and the delivery of multimedia applications such as digital pictures and music, video conferencing, video streaming and video monitoring. The Ovation MCU2000 offers a superior alternative to dial up and ISDN or for customers in areas without DSL or cable access. Ovation is powered by Conversa™, a software suite developed by Novatel Wireless that enables access to advanced software applications resulting from an innovative convergence of high-speed 3G Wireless Gateway WWAN and WLAN/LAN technologies. BreezeMAX Si: Keep it Simple! The BreezeMAX Si is a compact, portable, single box device that is deployed indoors, typically near the end user's PC. It is designed for plug and play operation, enabled either via a SIM card or by using a user-friendly application provided on a CD with the unit. The BreezeMAX self-install CPE supports intelligent antenna steering functionality using six antenna elements with 9dBi gain. Services and interfaces supported include 10/100 Base-T for IP data, 802.11b/g for WiFi hotspots, 1 or 2 POTS (RJ11) ports for voice services and battery back up. Vuoi prenotare senza impegno informazioni e prezzi su questo prodotto disponibile in Italia nel 2008? inviaci una mail. DHCP DHCP server for LAN and WLAN clients. The Gigaset SE461 WiMAX modem with router functionality supports data transfer rates of up to 20 Mbit/sec, guaranteed quality of service and bandwidth management. These features enable triple play, the combination of data, voice and video services. The advantage is that end users can obtain all the services from a single fixed-network or wireless provider. To permit worldwide use, the modem handles the frequency ranges 2.3 to 2.5 GHz, 3.4 to 3.6 GHz and 3.6 to 3.8 GHz. The Gigaset SE461 is very easy to install (plug and play). Thanks to remote device management, the device’s settings are automatically configured and administered. In addition, carriers can update the software, something that simplifies installation and operation of end-user devices for them and customers alike. An Ethernet interface and support of MS Windows, MacOS and Linux permit networking with other devices. Two different antennas enhance its possible uses depending on the environment and distance from the base station. 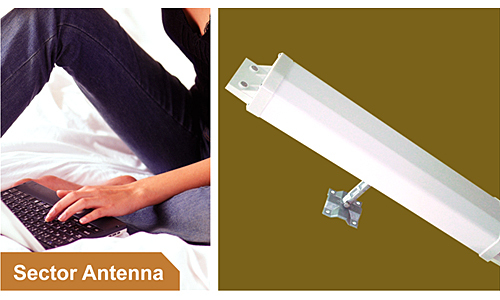 The desktop antenna is ideal for use directly at the workplace, whereas the outdoor antenna has a larger range. An output power of up to 27 dBM ensures efficient use of the network, supports connection of a large number of users and bridges large distances to the WiMAX base station. The WayMAX @vantage base station and NetViewer system from Siemens Communications for monitoring and controlling the network as well as the WiMAX end-user devices from Siemens Home and Office Communication Devices offer carriers an end-to-end solution from a single source. The attractiveness of this solution is confirmed by a number of orders that have already been won for it – from StartTelecom in Russia and Finnet in Finland , for example. The Gigaset SE471 is a WiMAX modem for wireless broadband access in three frequency ranges. It is based on the IEEE 802.16-2004 standard and apart from fast Internet access. It enables new and attractive services such as video on demand, video streaming and Voice over IP (VoIP). The Gigaset SE461 WiMAX modem provides high-speed, wireless access with data rates up to 20 Mbps upstream and downstream for receiving and delivery of data, voice and video services with guaranteed quality and grade of service. The Gigaset SE461 operates in Non-Line-of-Sight (NLOS) and can be connected to multiple types of antenna depending on use cases and radio connections. QuadMaxSystems first CPE is available in two different versions: QMS CPE-101 and QMS CPE-101W with a WiFi-router integrated. This CPE is cutting edge industrial design, with the basic functions that customer initially will need to use WIMAX. "The Book" is an all indoor CPE designed to self install by the end user. QMS subscriber terminals are CPE products developed to work with any WiMAX Forum Certified Base Station products. Built from the ground, based on the IEEE 802.16-2004 standard. “The Book” supports fixed, nomadic and portable services. "The Book" is build upon a proven scaleable Mini PCI platform. Using the Wavesat chipset developed by Hulu. Hardware specification on request. "The Book" holds the most basic functions, RJ45 connection (POE), Powerconnection and a SMA connection for the external antenna. Omron Corp. has introduced a global WiMAX band polymer antenna, the HAWK-WMX, for laptops, notebooks, tablet and ultramobile PCs. Smaller than competing products, the HAWK-WMX fits under the lid of notebook PCs, enabling computer manufacturers to design smaller and lighter models for highly mobile users, said Omron. The HAWK-WMX, which employs the high dielectric polymer material and precision molding technology used in Omron's UWB antenna range, measures 30mm x 6.6mm but can deliver uniform RF performance across three global WiMAX bands (2.3-2.8GHz, 3.3-3.8GHz and 5.25-5.85GHz). The HAWK-WMX is WiMAX MIMOi compliant, and with its global band attributes can also be used as a Wi-Fi (IEEE 802.11n) MIMO antenna. "As society becomes increasingly mobile, consumers are demanding devices that offer global connectivity in ever smaller and lighter formats," said Masaharu Tsujimoto of Omron's advanced components division. "WiMAX offers a powerful next-generation solution for providing wireless mobility, but the frequencies on which WiMAX services are offered differ from country to country and sometimes region to region. Meanwhile, computer OEMs and ODMs are already supporting multiple wireless protocols such as 3G, Bluetooth, GPS, Wi-Fi and UWB, each of which usually requires a separate antenna. With mounting space at a premium, there is a clear need for ultra-small antennas that will enable products to function in any region with consistently high performance. The HAWK-WMX delivers a small footprint without compromising performance and can replace five notebook antennas for WiMAX and Wi-Fi with three smaller ones." The HAWK-WMX is the latest in Omron's WiPLADS (Wireless Polymeric Advanced Devices) series of high dielectric, multiradio antennas for notebooks, tablets and ultramobile computers. The series includes UWB and Wi-Fi antennas. The WXA-HKFT model measures 30mm x 6.6mm x 3.6mm and has a VSWR 3 (max.). Frequency range is rated at 2.3-2.7GHz, 3.3-3.8GHz and 5.25-5.85GHz. 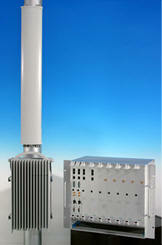 The WXA-HKFD device model with frequency range of 2.3-2.7GHz and 5.25-5.85GHz also has a VSWR 3 max. The device measures 16mm x 5.5mm x 5mm. The RNE2000B Reference Design Channel Card is an enabling product for Base Station Equipment Vendors for OFDMA IEEE802.16 downstream and upstream transmissions and can be used in first commercial stages for fast time to market. It contains a Power PC processor, which implements the air MAC protocol and programmable hardware (FPGAs) that implements an OFDMA PHY modem. Runcom’s RNU2000N Base Station Unit is a cost effective solution for Equipment Vendors as well as for Service Providers of IEEE802.16 based Mobile BWA applications. The product is sold as a stand-alone packaged single sector base station, and includes a Back plane, an RNE2000MB Mother Board, a power supply, a front panel equipped with LCD, keypad and LED and a radio transceiver. Navini has a complete portable broadband access infrastructure portfolio that makes broadband personal! * Small, sleek retail-friendly CPE and PCMCIA card makes broadband access personal and portable..anywhere, anytime. * Powerful BTS and antenna systems, and robust EMS. * Adaptive phased-array antenna technology delivering significantly larger coverage areas and the power budget required for indoor plug-n-play. * Delivering a Total Cost of Ownership structure that is superior than other solutions on the market. With powerful commercial validation of our patented Smart Antenna technology delivering zero-install™, non-line-of-sight portable broadband, Navini is demonstrating the viability, the economics, and the success of the mobile WiMAX 802.16e vision. Our amplifiers are an important part of cellular network base station system. Our product platform has a wide range of products for single-carrier and multi-carrier applications, and for 2nd and 3rd generation wireless cellular standards. Our system product enhances coverage and capacity of existing cellular networks, providing larger service area and better service quality to voice and data communication users. Wi-Tron's repeater and booster products enhance wireless network coverage and provide clear communication in the regions that experience dead areas. The repeater and booster products can meet the requirements for the wireless network such as GSM, CDMA, and WCDMA. These products can be used for enhancing in-building coverage as well. Proxim introduces a family of WiMAX Forum Certified™, TDD products that deliver the highest performance, most affordable wireless solution in licensed 3.5 GHz bands. This cutting-edge technology enables the delivery of compelling new services for Service Providers. Like all Proxim products, the Tsunami MP.16 3500 continues to offer a comprehensive feature set to future-proof wireless networks. Drawing on Proxim's leadership in the point-to-multipoint arena, the 3500 products have been developed as platforms to leverage these applications. By building off of an established Tsunami MP.11 product line, Proxim can evolve its expertise in serving the Service Provider markets with a product that is WiMAX compliant. Multiple security mechanisms protect operator, residential customer and enterprise privacy. The 3500 incorporates hardware and software features that reduce labor costs associated with initial deployment and post-sales maintenance. Triple play: voice, data and multimedia services. BreezeACCESS VL è la piattaforma broadband wireless OFDM multipunto più diffusa al mondo. Un sistema Ip broadbans per wireless DSL che opera su frequenze non licenziate (da 900 MHz, 2.4, 2.5, 3.5, a 5.0, 5.2, 5.4/5.7 GHz) e consente oggi servizi VoIP e dati di classe WiMAX nelle bande dei 5GHz. The RedMAX Subscriber Unit (SU-I) is an indoor broadband wireless subscriber access product designed to the IEEE 802.16-2004 standard . WiMAX Forum Certified™ ensures its interoperability with an emerging industry-wide base of compatible Point to Multipoint (PMP) equipment. Taking advantage of PMP delivery, the SU-I can accommodate several interfaces with traditional Ethernet; Ethernet + POTS ( VoIP). The RedMAX SU-I also features an LED signal-strength indicator for easy installation, while enabling SOHO business and residential user to orient the SU-I for optimal link connectivity. Redline’s built-in, third generation Orthogonal Frequency Division Multiplexing (OFDM) non-line-of-sight (NLOS) technology helps overcome common urban obstacles such as buildings and trees while maintaining high link availability. Rugged design standards and sophisticated technology, including advanced forward error correction (FEC), further combine to deliver wireline-equivalent high availability. Redline's RedMAX AN-100U is the world's first WiMAX Forum Certified™ base station. Easy and cost-effective to deploy, the RedMAX AN-100U facilitates the rapid provision of new fixed and nomadic wireless broadband services by service providers , while its very low latency ensures reliable delivery of time-sensitive services, including circuit-switched voice traffic, voice-over-Internet Protocol (VoIP), video and prioritized data traffic. The AN-100U design architecture enables 'over-the-air' upgrades in the field through simplified software downloads and the ability to dynamically “on-the-fly” customize individual Quality of Service (QoS) settings, according to the service level agreement (SLA). The RedMAX Base Station can be deployed in clusters of up to six (60 degree) sectors, supporting thousands of unique user-data flows and hundreds of simultaneous subscribers per sector. The GPS time synchronization feature ensures efficient use of available spectrum and channels, providing scalable and reliable dense cell deployment of Time Division Duplexing (TDD) base stations radios. The hardware is fully upgradeable in the field by software download, to accommodate such future enhancements as IPv6 support, scalability, additional classifiers, alternative encryption standards, and the continued development of the 802.16 standard. Adherence to stringent carrier-class NEBS Level 3 specifications provides high reliability for mission critical deployments. The indoor unit has a selection of radios for operation in the licensed and unlicensed bands using the 802.16-2004 specified 3.5 MHz and 7 MHz channel profiles. The RedMAX Subscriber Unit (SU-O) is an outdoor broadband wireless subscriber access product designed to the IEEE 802.16-2004 standard . WiMAX Forum Certified™ ensures its interoperability with an emerging industry-wide base of compatible Point to Multipoint (PMP) equipment. Operating in the 3.4 – 3.6 GHz and 3.3 – 3.5 GHz bands, Redline’s built-in, third generation Orthogonal Frequency Division Multiplexing (OFDM) non Line of Sight (NLOS) technology helps overcome common urban obstacles such as buildings and trees while maintaining high link availability. Rugged design standards and sophisticated technology, including advanced forward error correction (FEC), further combine to deliver wireline-equivalent high availability. © 2004-2008 Wi-Max.it All rights reserved.